The Thermo Scientific Precision 180 Water Bath maintains the water bath temperature which ranges from ambient to 95ºC with ±0.2°C uniformity (at 37°C) and ±0.1°C control resolution (at 37°C) with a stainless-steel gable cover. It has a choice of analog or digital temperature control and chamber capacity of 1.5 liter. The Thermo Scientific Precision 180 Water Bath 2823 makes operation easy buy supplying front-mounted controls. Thermal runaway is prevented by over temperature safety circuitry. The Model 180 Water bath has analog controls that are simple to use and it is favorable for applications where temperature set points seldom change. The Thermo Precision 180 Water Bath has a backup high-limit safety thermostat and illuminated power switch. With the push of a button it allows the temperature set point with ±0.1°C precision and a microprocessor control that have bright three-digit LED temperature readout. 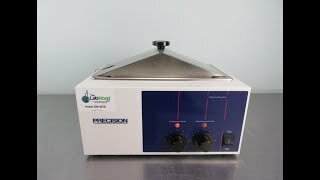 The Thermo Precision 180 Water Bath has automatic over temperature protection. It includes a stainless steel gable cover, diffuser shelf, and a spirit filled thermometer. 6 x 11.5 x 2"
This Thermo Precision 180 water bath has been fully inspected and is performing to expectations. All of our lab equipment comes backed with our standard warranty. Should you have any questions, please dont hesitate to contact us.